Thus, when the very nice people at Snugg offered to send me a phone case, I thought that was really nice of them. 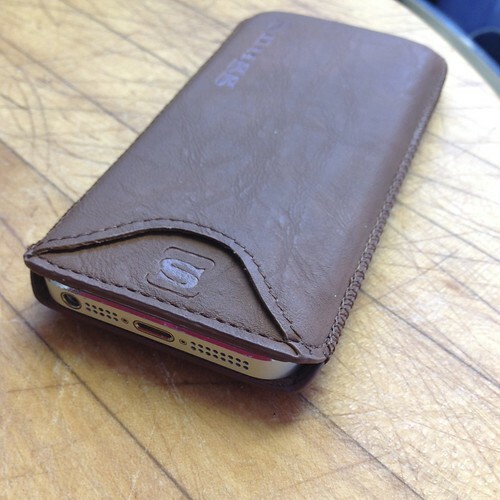 I picked out their pouch case (in distressed leather) for the iPhone 5 because it looked cool. That's almost all you need to know about the Snugg pouch case. Sliding the phone into it, and pulling the tab that ejects it, is a really pleasing aesthetic experience. It works to get the phone out of a very nicely tight case, but it's also a great fidget toy. The rest is details: there's no belt loop, so this is strictly a slipcase, but it is slim and fits nicely into my jeans pockets. There is a slot for a credit card, but getting said card out is fussy. The pull-tab works exactly as you'd expect: the ribbon goes under the phone, and when you pull it, it lifts it from the bottom. There's an elastic built into the system that pulls the tab back to its resting place when you're done, whether the phone is in the case or not, and as a final nice touch, magnets hold the tab nicely flush with the case so it doesn't flop around. Fit and finish is acceptable, especially for the price. The leather looks and smells like leather, though "distressed" is perhaps pushing it for this case. I'd describe it as dull-finish and showing a lot of grain, but it doesn't look distressed. Mildly harried, at most. Regardless, it's pretty. The case is sewn together with baseball-stitches over the edge, which looks really cool, but I have concerns that these stitches are structural, so they are probably the weak link in the long-term (possibly, I'll admit, very long-term) durability of the case, as the stitches will get frayed long before the leather is likely to give out. Protection seems pretty good. The case isn't deep enough that the open end actually protects the phone very well, but the rest of the case looks like it would do a good job of deflecting drops and scratches. It's not an Otter case, and of course you have to remove the phone from the pouch to use it, but as purse or pocket protection for your phone, it's very good. Is it practical? Hm. The one big advantage I discovered is that with this case, I got the rest of my pocket back. I'm normally very careful about putting coins or keys in my phone pocket, but the Snugg pouch removes that concern. It's not an always-on case, and indeed it's a tight enough pouch that fitting a phone with a case on it is unlikely; maybe the thinnest of back shells would slip in. Maybe. But it's super-stylish, and the pull tab is a lot of fun. As the old saying goes, those who like this sort of thing will like it very much. The good people at Snugg make the same type of case for a variety of other phones, and in other colors. Will I continue to use it? The phone is in it right now. But I fear I am too much of a phone-wrecker to keep taking my phone out of its shell. I expect I'll soon revert to a big ugly perma-case so I don't break my phone's screen. Again. Disclosure: Snugg provided the case (which I get to keep) for this review.